Temporal Power flywheels are used for short term energy balancing on the power grid. As the first jurisdiction in North America to eliminate coal as an electricity source, Ontario has increased its use of renewable energy sources, such as wind and solar. However, this changing supply mix introduces new challenges for running the power system. Ontario has seen much advancement to its energy innovations and is home to many world leading energy technology companies. The province has become a smart grid leader with over 1 million smart meters installed all over the province. Furthermore, we recently saw the Ontario Ministry of Energy’s Long Term Plan call for 50 MW of energy storage. This resulted in the IESO issuing an RFP for 35 MW of energy storage in an effort to increase Ontario’s reliability, decrease costs and allow the continue integration of renewable sources. Both initiatives reflect Ontario’s supportive innovation ecosystem and confirms the provinces commitment to clean energy practices. How does the flywheel technology work? A flywheel is a mechanical battery that stores electricity as kinetic motion in a spinning steel rotor levitated on magnetic bearings. Storing 50 times more energy than traditional flywheel technologies, Temporal Power flywheels are the highest energy flywheels in the world. To store energy, the flywheel uses power from the grid to drive a motor that spins it at high speeds (greater than 10,000 RPM). To release energy, the flywheel’s momentum causes the motor to act as a generator, which then slows down the flywheel, putting power back onto the grid. When arranged together, Temporal Power flywheel systems offer multi megawatts of fast response capabilities. What are the benefits of Temporal Power’s flywheel technology? Temporal Power’s flywheel is made of fully recyclable and non-toxic components, making it a truly clean technology. Since our flywheels are made of solid steel, they do not degrade with the heavy usage required for short term balancing, resulting in better performance, a longer life and lower costs. It also boasts low lifecycle costs with minimal maintenance over its 20-year operating life. In what applications are flywheels best suited for? Temporal Power flywheels are used for short term energy balancing on the power grid. Three examples of short term energy balancing are grid balancing, renewable integration and isolated grids. Grid Balancing: Grid balancing is where the grid requires the constant balancing of supply and demand. Grid balancing has historically been achieved by conventional power generators that reserve capacity in order to provide a range of ancillary services. The rapid response time and high ramp rate of Temporal Power’s flywheels can result in more energy being delivered precisely when it is needed. Renewable Integration: The second type of application addresses the intermittencies of renewable power from solar and wind sources. Flywheels can balance out these short term intermittencies that cause both local and grid wide power quality challenges. Responding rapidly to short duration power fluctuations from renewable generation, Temporal Power flywheels act as shock absorbers by smoothing power flows to reduce strains on the electricity system. This results in benefits to power producers, utilities and customers, which include increased renewable penetration, reduced curtailment and improved power quality. Isolated Grids: Our third application is supporting island/isolated grids where there needs to be perfect energy balance. Island grid systems typically rely on costly fuel to power their grids. This has led to the introduction of more renewable sources such as wind and solar, resulting in challenges in managing the excess renewable power. Temporal Power’s flywheel technology is able to displace the need for costly fuels, while enabling greater utilization of power which otherwise would be curtailed. 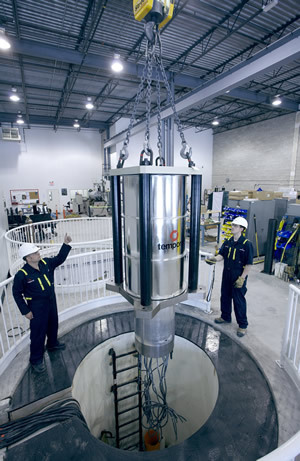 There are several energy storage technologies (compressed air, pumped hydro, batteries, etc.) – how do these compare to flywheel technology and in particular, Temporal Power’s flywheel technology? It can be useful to think about energy storage technologies in two broad categories: short term and long term. Long term energy storage is typically used to store energy for many hours, days, or seasons. Compressed air, pumped hydro, and many types of batteries fit into this category. Short term energy storage is typically used to help with short term energy balancing and power quality issues that require near constant cycling to keep the power system in balance. Flywheels and some types of batteries are well suited for this application. Due to the constant heavy cycling of this application, one must consider anticipated cycling requirements, replacement costs and total cost of ownership resulting from the application use. Flywheels are designed for 20 plus years with no degradation due to cycles or depth of charge. How can Temporal Power’s flywheel technology help solve the grid issues in Canada and throughout the world? In Ontario, Temporal Power’s flywheel technology is providing Regulation Services to the IESO to help maintain grid balance and add flexibility, while enabling existing clean generation sources such as hydroelectric to run or to turn off whenever it is optimal. This optimization of generation fleets represents an opportunity on most power grids in the world. Isolated grids, such as islands, face a particularly acute challenge with greater amounts of renewable power coming on-line much faster as a total percentage of their generation mix. To meet this challenge, fast response energy storage has a role to play in enabling more renewable power while maintaining a stable grid. This lesson first learned on isolated grids is one that can be applied to increasingly larger power systems, offering a key solution for efficient, reliable, cost effective systems with high amounts of renewable power. How much physical space is required for a typical flywheel installation and are there special safety or environmental requirements? The space depends on the size of the system. A 5MW system typically needs 0.5-0.75 acres. For safety, Temporal Power flywheels are installed underground and do not pose any environmental threats or give off any type of emissions, further strengthening our position as a clean technology. How does the cost of your flywheel system compare with other more conventional storage methods such as batteries? Temporal Power's flywheels have the lowest total cost for high cycling applications such as grid balancing. Batteries are more cost effective for applications which require infrequent cycling. As flywheels do not have the same maintenance or replacement costs as batteries, they are significantly less expensive over a 20 year time period. Where are you focusing your marketing efforts and when will we start to see your flywheel systems being installed? Temporal Power has its first flywheel facility operating on the Ontario grid already. In addition, a second plant is currently being commissioned in Ontario at this time. While Ontario will continue to be a key market, Temporal Power is pursuing opportunities around the globe. Key markets include island grids and locations with high penetration of renewables. Cam Carver is the CEO of Temporal Power Ltd. He brings more than 15 years of experience as a technology entrepreneur and management consultant specializing in clean technologies. 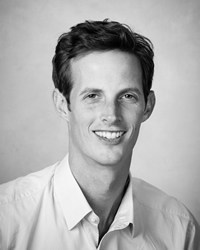 Cam is a co-founder of Temporal Power and has led the company in private financings and government awarded grants. He is the founding Chair of Energy Storage Ontario (formerly known as Ontario Energy Storage Alliance), Ontario’s energy storage industry group, and also sits on the City of Mississauga’s Economic Development Advisory Council. Cam holds a Master of Business Administration from the Richard Ivey School of Business at the University of Western Ontario and is a member of the Young Presidents Organization.